2. Combine the butter and sugars in the bowl of a stand mixer fitted with the paddle attachment and cream together on medium-high for 2 to 3 minutes, until fluffy and pale yellow in colour. 3. On low speed, add the eggs and vanilla extract, and increase the speed to medium­ high and beat for 1 to 2 minutes, until the sugar fully dissolves and the mixture is a pale white. 4. On low speed, add the flour, oats, salt, cinnamon, baking soda and shredded coconut. Mix for a minute, until your dough comes together and any remnants of dry ingredients have been incorporated. 5. Pour the confectioners sugar into a bowl. 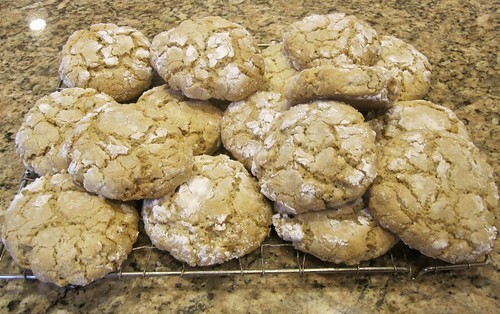 Using an ice cream scoop, form balls of dough, roll them in the sugar and place them on a parchment-lined baking sheet. 6. Bake for 10-12 minutes, until the tops have lightly crackled. Remove and allow to cool on a baking rack.